I'm sure you all know the scene this represents, so I guess there's no need to explain the context. I'll leave a link below, just in case. What can I say? It's Back to the Future in the Rick and Morty art style! Doc, Marty and Jennifer are about to go to the distant future year of 2015, where roads apparently aren't needed. "Mahrty! My balls! 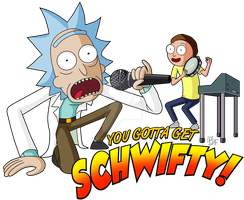 You gotta..."
Dimension where it's the Back to the Future™ Dimension but every character is a Rick and Morty character. Well, except there's a trashy flying saucer instead of a cool '80s sports car. ...It's funny because, in the end, Jerry is ultimately his own Biff. You don't even need a traditional antagonist to drive the plot. XD I also forgot to add that everything looks like the Rick and Morty reality aka the animation style. Did you ever watch the "Road to the Multiverse" Family Guy epsiode? I liked the concept of other dimensions with different animation styles (They even went to a "realistic live action" one, they did not like it.). And there is a Morty in the "Creepy Morty" that has a different animation style from everyone else. Looks like a "south park" Morty. I have, and it makes for some good comedy. I think the best gag was Disney Family Guy. The whole idea of a multiverse has fascinated me since I read "Crisis on Infinite Earths" as a kid. It's a great plot device, but also an unfortunate victim of overuse these days. Huh, In my experience I haven't seen it THAT much. But yeah. Makes you wonder if Christopher Lloyd and Michael J. Fox watch Rick and Morty. I was pretty proud of it at the time. Thanks a lot! Well, you're forgetting the middleman. Rick and Morty were adapted from parodies of Doc and Marty, 'Doc and Mharti'. Amazing how what amounted to a vulgar temper tantrum against Universal Studios grew to become such an incredible series. Personally, I see it as Back to the Future: the Animated Series with some twists. I keep some pretty meticulous records of the similarities. You're a Rick? 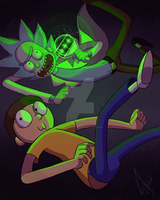 Funny, I've always seen myself as Morty. The similarities are pretty uncanny. I dress like both Morty and Marty pretty regularly- and I must say, the denim jacket and red puffer jacket combo look pretty cool. Bonus points for wearing the aviator shades. I've got some crossover art coming up, so stay tuned! That outfit must have been difficult to assemble! Any of the Doctors are pricey to put together, but Five would be the hardest (short of Six). I don't know about you, but 'Cricket uniforms' are a little hard to come by across the pond. Sounds like it was worth it! you.. you y.. you're gonna come b..BURP..ack with me mmmMorty, your your kids are in d..danger Morty, we gotta go to the ffff..future Morty! Aw jeez Rick, I-I-I just got here, y'know? Jessica's here, R-Rick, w-w-we were gonna go drive around, a-and make out, a-a-and probably get married! Y-you're screwin' up my future, Rick! You're screwing it up!